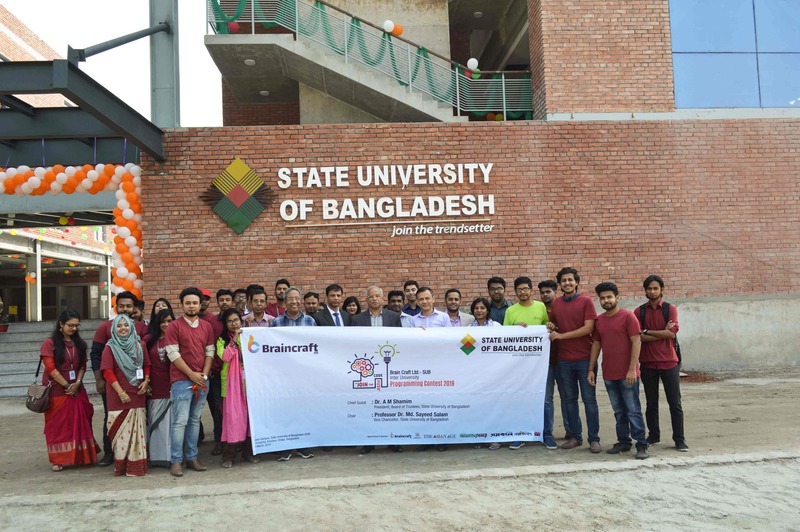 The State University of Bangladesh (SUB) hosted the BrainCraft Ltd.-SUB Inter-University Programming Contest (IUPC) 2019 on March 9, 2019 at its permanent campus at Kanchan, South Purbachal, Dhaka. The event was organized by the Department of Computer Science and Engineering, SUB. This contest drew numerous programming enthusiasts for solving complex real-world problems using advanced knowledge of computing in an exhaustive five-hour session. One hundred and nine teams from fifty public and private universities from around the country participated in the contest. The contest was inaugurated by the Vice Chancellor of SUB, Professor Dr. Md. Sayeed Salam. Professor Dr. Mohammad Kaykobad from BUET led a fourteen-member panel of judges. Prizes were awarded by the Chief Guest, the president of the Board of Trustees, State University of Bangladesh, Dr. A.M. Shamim. He congratulated the winners and wished a prosperous life for all contestants. Champion, first runner up & second runner up prizes were awarded to BUET BloodHound, BUET KnightMare and BUET Upside_Down respectively. Dr. Kaykobad stressed on using the intellectual capital of the youth in Bangladesh towards achieving the dream of Digital Bangladesh for a prosperous future. The chair of prize-awarding ceremony, the Vice Chancellor of SUB, Professor Dr. Md. Sayeed Salam profusely praised the efforts of the Department of CSE, SUB in accomplishing the daunting task of arranging this grand event. Among others, Professor Emeritus Dr. Iftekhar Ghani Chowdhury, representatives of sponsors and media partners were also present. Finally, Mr. MasudTarek, Head, Department of CSE, SUB concluded the session by thanking all concerned for helping in arranging this grand event.